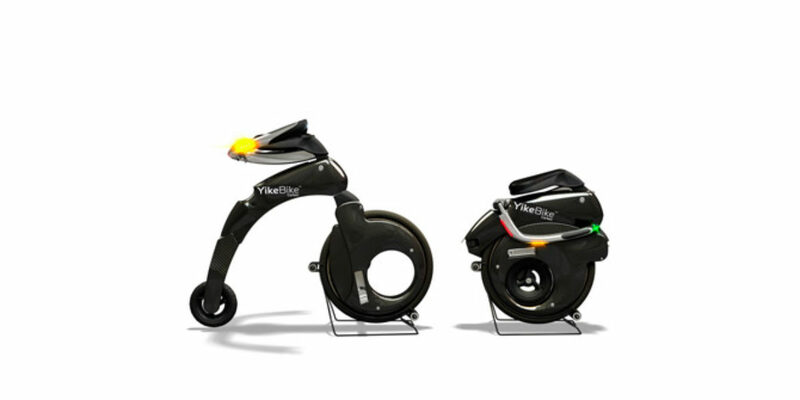 The YikeBike is more of a transporter than a bike because it’s fully electric powered, you can’t pedal it. 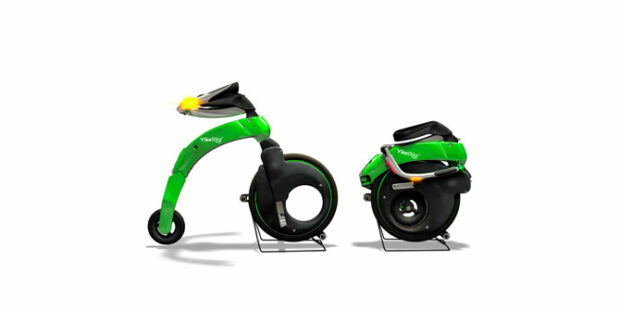 It’s Composed of two wheels with one behind the other just like a bicycle but you steer partially with your legs and partially with handlebars that come from behind and wrap around the sides. It resembles the penny-farthing or “ordinary bicycle” of the mid 1800’s that had a very large front wheel and smaller stabilizer in the rear. And just like these old fashioned bikes, the YikeBike can be a bit unstable at first. 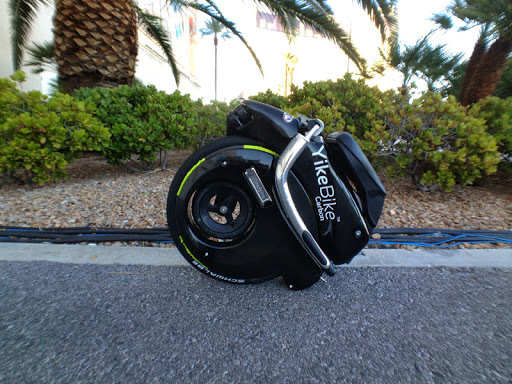 The YikeBike’s motor is built right in to the front wheel system and offers good torque for hill climbing, a decent top speed and even regenerative braking. 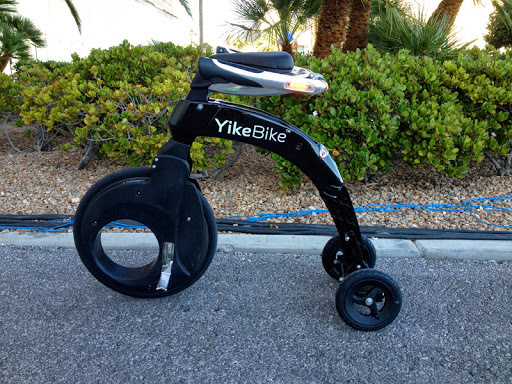 The YikeBike can be a thrilling experience for the first few rides because you rely on your legs to stabilize more than your arms and feet as with a more traditional bicycle. Thankfully, the seating position isn’t very far off the ground and the top speed is about 15 miles per hour so it doesn’t feel dangerous to learn. 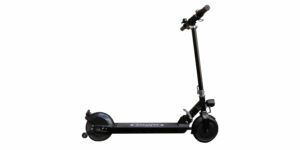 It operates much like the strider bicycles that have become popular for teaching kids how to ride. Once you’re moving forward, the bike becomes more stable and feet can be rested on two silver pegs extruding from the front wheel base. 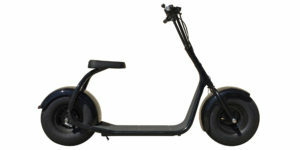 The trick to stabilizing the ride is gently squeezing your legs together to help steer the front wheel. 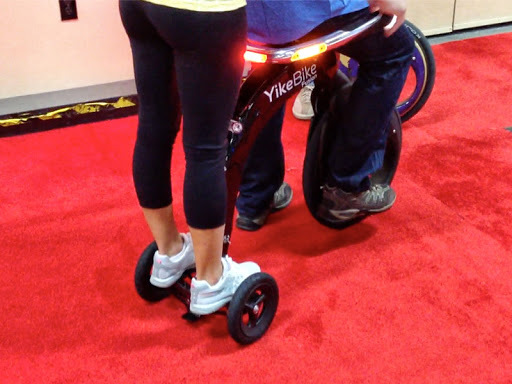 In my opinion, the YikeBike is all about enabling commuters. 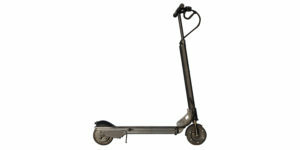 It makes getting to or from the subway, train or bus station more manageable. No more slow walks, no more sweating and best of all, no more oversized systems that are too heavy to lift. 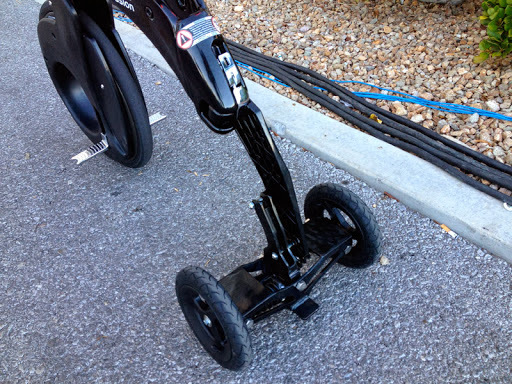 I’m talking to you Mr. Segway! 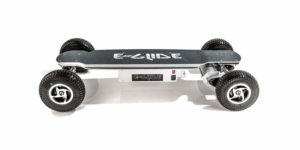 The Carbon is the top of the line model weighing in at under 25 pounds! 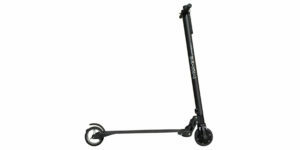 It folds down to the size of a large briefcase and can be carried in one hand. It also looks relatively cool (especially in the carbon weave) and won’t seem out of place leaning against a desk in an office. Taking just five seconds to completely fold or unfold, it truly is convenient. 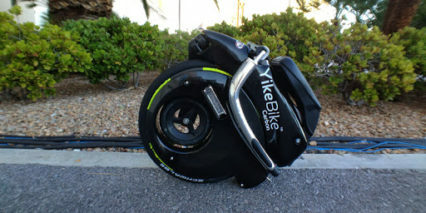 Driving the YikeBike is a 450 watt motor built right into the front wheel. You can’t see it but you do hear it whirring as you squeeze the throttle on the right handlebar. 450 watts is quite a lot of power for such a small, lightweight system. 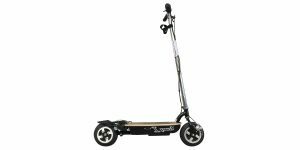 The battery supporting this motor offers 37 volts of power and 6.6 amp hours of range. Overall, this is quite good and the bike feels very capable riding around on the flats. 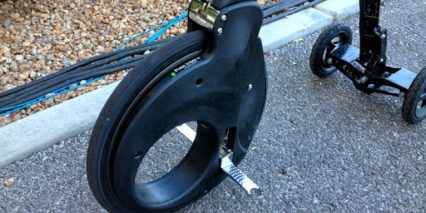 Even though the range and ride time is a bit more limited than full sized ebikes, the charge time is significantly less at just 1.5 or 4 hours depending on if you use the quick charger. If you left one charger at the office, you’d have no problem topping the YikeBike off before riding home or even out to lunch. 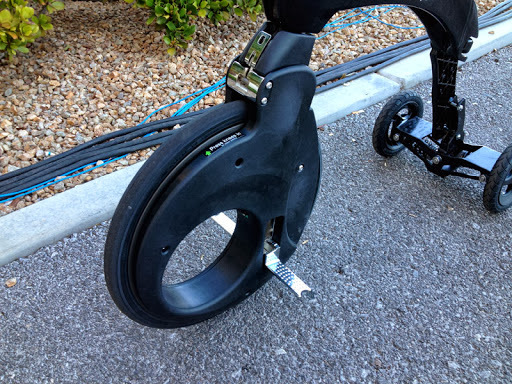 The downsides to this system are the learning curve to figure out how to ride, higher pricepoint (relative to the Synergy or Fusion) and lack of shock absorbers or suspension. 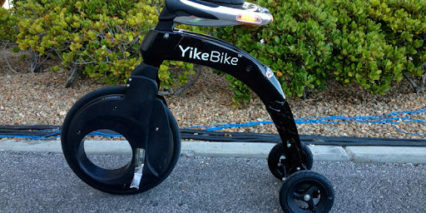 Given the lower top speeds and primary use of sidewalks or bike lanes however, the YikeBike rides well enough and isn’t that uncomfortable. 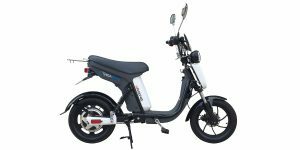 The tires offer a bit of give along with the seat and I found that pushing myself up using the foot rests reduced the shock of larger bumps. Overall, it’s a quirky but functional machine that does its job well. One of the big up-selling points from the lower end Fusion is the locking mechanism for the rear wheel. 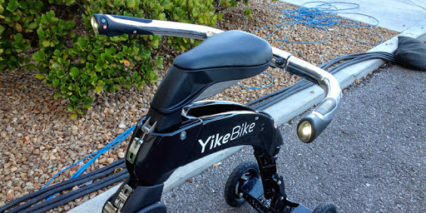 The two higher end YikeBikes also feature carbon accents and a slightly cooler frame design. A lot of thought has gone into this very custom electric vehicle from New Zealand. It’s got headlights, tail lights, turn signals, flashing hazard lights and even a small chirping horn. It’s definitely a head turner, something you’d expect to see in a science fiction movie. Considering the price of ~$4,000 Carbon feels expensive but is definitely lighter weight. For an extra 6 pounds of weight you could save $2,000 and get the lower-end Fusion which is basically the same in terms of drive system. 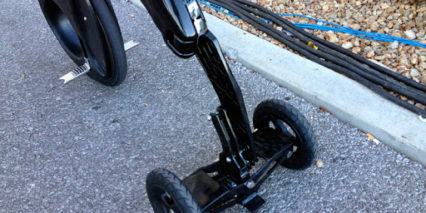 I remember when the Segway came out, it got a lot of questions and criticism but eventually found a niche with security personnel and city tours. 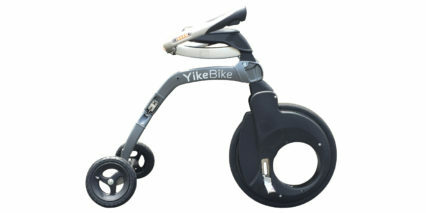 The YikeBike addresses the needs of a much larger audience on a more practical level. It cuts out that “extra mile” stopping so many people from commuting to work with more efficient, sustainable public transportation options. 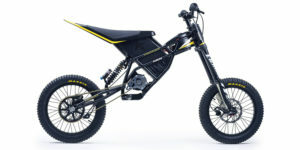 The Carbon is a wonderful electric “bike” but it won’t help you burn the same calories as a true pedaling ebike would. Keep that in mind because the max recommended weight is 220 pounds… Max recommended height is 6’4″. Hi! 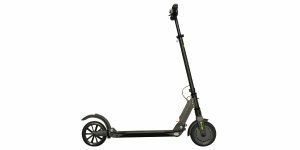 It says that the riders weight must is 100kg, what happens with the passenger attachment as this would surely exceed the 100kg limit unless the two riders were featherweight! Thanks! 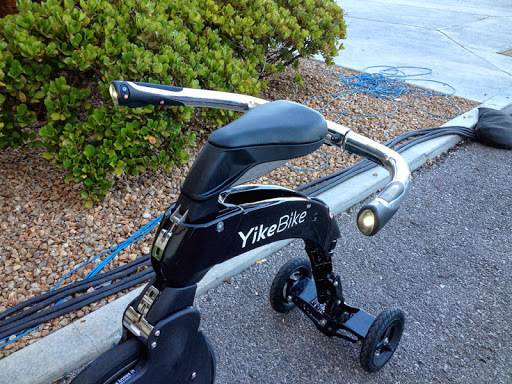 Hi Mark, that’s a really great question… I’m not as familiar with the YikeBike and it’s hard to comment on their weight limit. Where did you find the 100kg (220lb) weight limit? You make a great point that this seems low for two riders however I did see two people doing just this at Interbike (it was a man and a woman). Their combined weight was probably over 100kg as you suggest but I cannot say for sure. 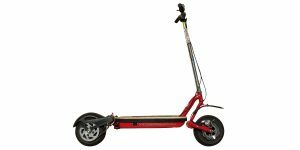 Maybe the stated max weight is for liability but the bike can actually work with more weight?